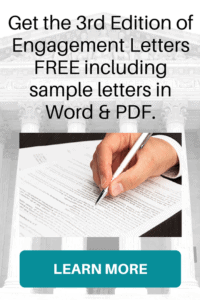 What should attorneys have in their Engagement Letters? 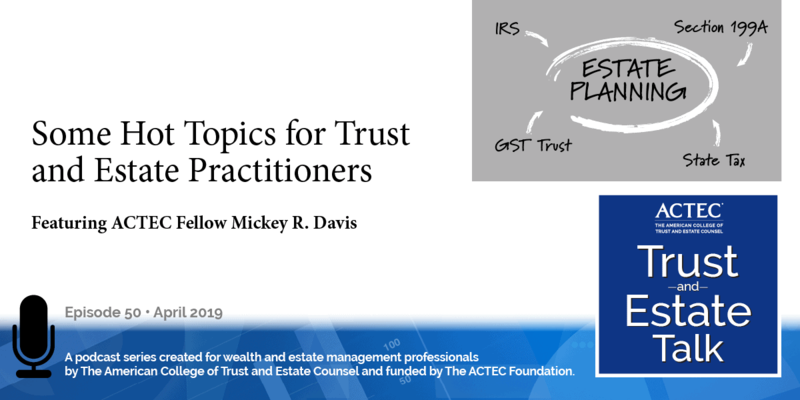 “What Should Attorneys have in their Engagement Agreements” that’s the subject on this ACTEC Trust and Estate Podcast. This is Susan Snyder, ACTEC Fellow from Chicago. ACTEC has just published its 3rd Edition of the Engagement Letters Guide for Practitioners. 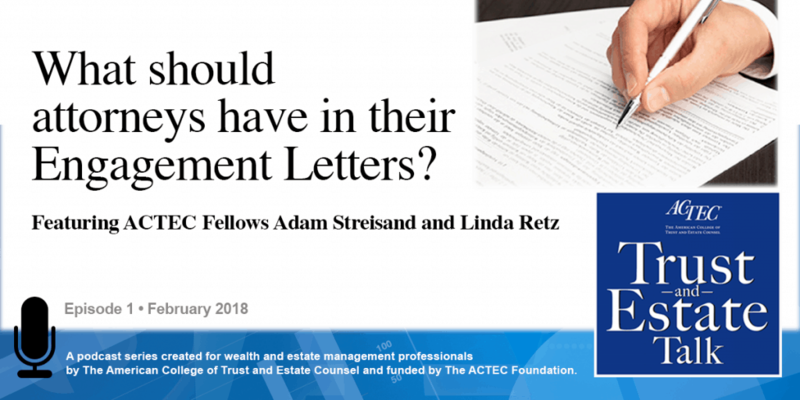 To give you a guide as to what should be in your engagement agreements we will hear today from ACTEC Fellows Adam Streisand of Los Angeles and Linda Retz of Torrance, California. Welcome Adam and Linda. Thank you, we’re happy to be here. Well first of all let me say that engagement letters are an invaluable tool for setting the stage for the representation and managing a client’s expectations. And the first task at hand in drafting an engagement letter, of course, is to identify the client or clients and define the scope of the engagement and in what capacity the clients will be represented. Adam, can you tell us a little about that? Yeah, you know, Linda, what’s really interesting is that many lawyers when they draft engagement agreements simply identify the client, “I’m representing you, Judy Jones,” maybe they reference it’s in the capacity of the estate of “George Jones” and don’t think about how important it is to be more specific about exactly in what capacity you’re representing the client and what the scope is. And I’m going to give you a little bit of a story about a recent case that will make it clear as to how important it is to identify the capacity in which you are representing a client. Just as one example as to why it’s important to be specific in engagement agreements. So the case is called Urick v. Urick (U-R-I-C-K), recent case from the Court of Appeals of California. Aileen Urick established a trust in 2013 and she nominated her daughter, Dana, to be the trustee and it’s a Charitable Remainder Annuity Trust–a CRAT. The CRAT would provide income would go equally to Aileen’s children, Willis and Dana, and Dana’s child. The remainder would go to the Phillips Andover Academy in honor of Aileen’s late husband. So Aileen died, and Dana became the trustee. And in February 2016, Dana sought to reform the trust; she filed a petition to reform the trust, but she didn’t say in what capacity she was filing that petition. Was she filing it as a trustee, or was she filing it as a beneficiary? And that’s important because what she was trying to do was to reform the trust, claiming that only Dana and Dana’s child would be the beneficiaries. If she was seeking to modify the trust in her capacity trustee, no problem in terms of the no contest clause, but big problem if she was doing it as a beneficiary. So that just highlights how important it is at the very outset in your engagement agreement and then, of course subsequently, to make sure you have identified specifically in which capacity you’re representing a client. That just gives you one little horror story about why the importance of engagement agreements and why it’s important and useful to go to the ACTEC website, look at some of the forms that we have, and which checklists on the kinds of issues you should consider, including this one, in creating your engagement letter. Thank you, Adam, that’s very informative. Now, we know that often times in estate planning context and in litigation matters,we’re asked to represent more than one client and certainly there are potential conflicts of interest that arise in those situations. And there can be two kinds of conflicts of interest, one where, let’s say you and I are married we’re going to see a lawyer to have our estate plan done, and, another one where perhaps we’re going to see an attorney in a firm and we may be parties to litigation and we’re not aware that perhaps the firm represents other clients in unrelated matters. Can you tell us a little bit about that and what disclosures should be made in the engagement agreement? Sure. So, the key is informed written consent, right? So the effectiveness of any conflict waiver- and of course you can waive, you can have clients waive conflicts- is informed written consent. Was the client provided specific or sufficient facts from which the client could make a knowing waiver of the consequences of waiving that conflict with the respect to the lawyer? So, the circumstance that you first mentioned, lawyers representing two clients jointly, husband and wife for example, or perhaps representing multiple generations, and we’ve included in our engagement agreements in our estate planning context, in our business transactional engagement agreements, and our litigation engagement agreements waiver of conflict provisions, which attempt to be specific. You know it’s easier when you have two clients that you’re going to represent jointly, and you can sort of tell the clients in writing what the potential consequences are of representing two clients jointly. For example, you may not be able zealously to advocate the position of one client because it may impact the other client, right? And so you can tell the client that upfront, and we’ve got some very good language in these engagement agreements that will help to provide inform written consent. There’s a whole different circumstance that you alluded to, which is, can you get a client to waive in advance a potential conflict of interest that might occur in the future with a different client? And the courts that have dealt with that have said, “Look, you can’t just get a client to say, ‘Well, I may represent- your lawyer may represent a client in the future and that client may have some conflict with you and we can represent that client, even represent that client and sue you.’” That kind of sort of generic waiver is not going to really provide informed written consent. Generally, when these waivers work is when you can identify the specific client with whom there might be a conflict in the future and the nature of possible conflict. For example, there was a case in which Heller Ehrman had a long-standing relationship representing Visa, and it took on the representation of another firm called First Data, which developed a system for credit card transactions. And Heller Ehrman said, “Look, we represent Visa and there could be circumstances in the future- we don’t know of any at the moment- but there could be circumstances where your credit card processing system could have some impact on Visa, and we’re going to represent Visa in the future, even if it’s Visa suing you, First Data.” And First Data agreed to that waiver and subsequently after the representation of First Data Heller Ehrman represented Visa against First Data and the court said, “Hey, First Data, you waived it.” And that was effective. So it’s important to identify the specific party? As much as you can. And the other day, you pointed out something important which I think we should talk about just for a second, remember that there are rules of professional conduct about how much you can disclose about a particular client, even in trying to resolve conflicts. And that’s a delicate balance about 1) you have to be specific in order to get informed written consent and 2) you have to make sure not to disclose another client’s confidences that that client doesn’t want you to disclose. So if we are concerned about getting informed written consent we might ere on the side of disclosing as much as possible, but then we run up against the rules with respect to client confidences. We’ve got to be careful. Well thank you Linda and Adam for helping us with our Engagement Letters. 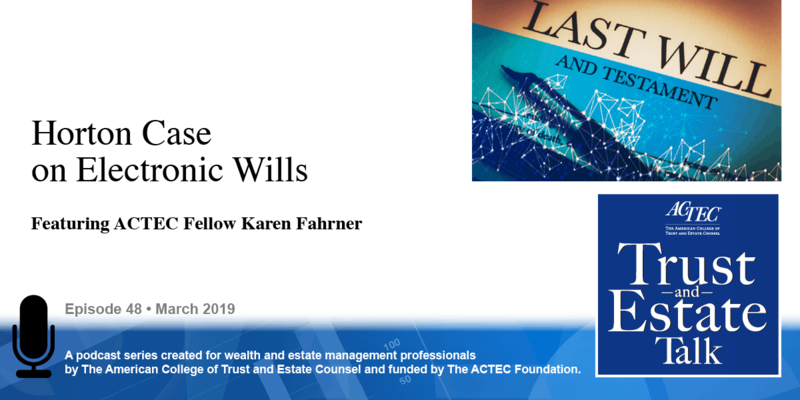 This podcast was produced by The American College of Trust and Estate Counsel, ACTEC. Listeners, including professionals, should under no circumstances rely upon this information as a substitute for their own research or for obtaining specific legal or tax advice from their own counsel. The material in this podcast is for information purposes only and is not intended to and should not be treated as legal advice or tax advice. The views expressed are those of speakers as of the date noted and not necessarily those of ACTEC or any speaker’s employer or firm. The information, opinions, and recommendations presented in this Podcast are for general information only and any reliance on the information provided in this Podcast is done at your own risk. The entire contents and design of this Podcast, are the property of ACTEC, or used by ACTEC with permission, and are protected under U.S. and international copyright and trademark laws. Except as otherwise provided herein, users of this Podcast may save and use information contained in the Podcast only for personal or other non-commercial, educational purposes. No other use, including, without limitation, reproduction, retransmission or editing, of this Podcast may be made without the prior written permission of The American College of Trust and Estate Counsel. If you have ideas for a future ACTEC Trust & Estate Talk topics, please contact us at ACTECpodcast@ACTEC.org. A review of 2019 hot topics for trust and estate practitioners including IRS Anti-Clawback and Section 199A regulations, GST Trust modifications and state tax developments. 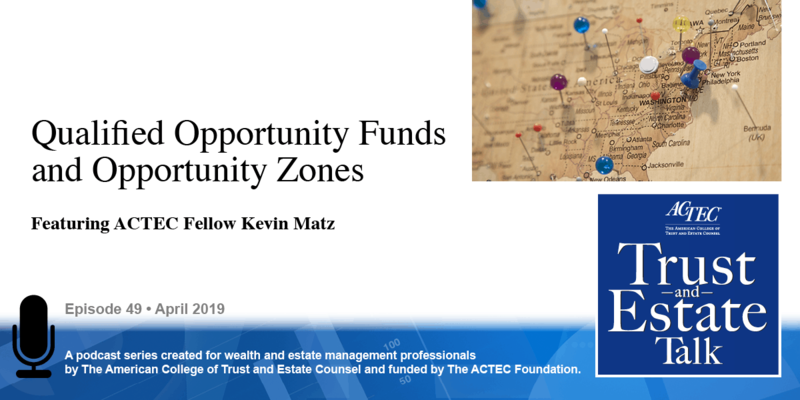 An explanation of how Qualified Opportunity Funds and Opportunity Zones work and some of the intricacies surrounding them as of March 2019. Can a person create a valid will that is not formally executed as required by state law? Find out more about electronic wills through discussion of the Horton v. Jones case.